Mount Langley is one of the California fourteeners (it’s elevation is over 14,000 feet). Actually there is debate on the actual elevation of 14,026 or 14,032 feet. During the spring, summer and autumn, this is an amazing relatively uneventful climb. The trails can take you past the Cottonwood Lakes, Golden Trout wilderness and what an amazing view you are provided with. To fish these amazing finger lakes you must have a permit. Not only that, but you must hike through the back-country to get there. This means for the most part, your fishing day may be unspoiled by others as you fish these wild lakes alone, with ample fish. Most lakes are catch and release, however, 2 of them are catch and keep above a certain size of fish. During the summer months, Mount Langley is potentially one of the easiest California Fourteeners to climb if the Army Pass route is chosen. It is the southernmost fourteener, and the most desert-like of the Sierra Nevada fourteeners. The North and South faces provide excellent technical rock climbing, while Old Army and new Army Pass provide an easy walk-up. In the winter or in inclement weather, that may not be the case. Click here to jump directly to our story and pictures. Take the 395 to Lone Pine, CA, head west (toward the mountains) on Whitney Portal Road. About 4 miles up, turn left for Horseshoe Meadows Road and follow it to the Cottonwood Lakes/Army Pass trailhead. Be sure to turn right at the sign for Cottonwood Lakes trail, otherwise you will end up at the trailhead for Cottonwood Pass. There is a walk-in campground, bear boxes and toilets (they stink) at the trailhead, as well as ample parking. FYI in Lone Pine there are a few outdoor stores. Each has almost everything you could imagine wanting on your adventure there, weather it is mountaineering, hiking, or climbing etc. I swear, even the hardware store sells equipment. Quota from May 1st through November 1st and permits can be obtained from any one of the four Ranger Stations: Mono Lake in Lee Vining, Mammoth Lakes Visitor Center in Mammoth, White Mountain Ranger Station in Bishop or Lone Pine Ranger Station in Lone Pine. 60 spots on the quota, 36 are held for reservations and the other 24 are for walk-in permits. $5.00 per person to reserve a permit in advance. 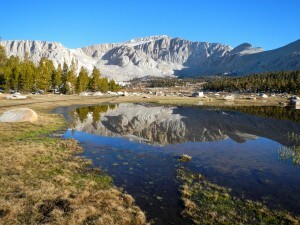 All other times of the year have no quota on trail users, but require a wilderness permit, which can be obtained free at the ranger station in Lone Pine. The mountain is always open, but the road is not plowed during winter. Camping requires Over night permit, all year round, and quotas apply as above. Great snow shoeing in the winter months, be sure to have all necessary equipment for the route and time of year you choose. People are killed in the mountains almost every year due to lack of preperation. Which leads me to our ADVENTURE. 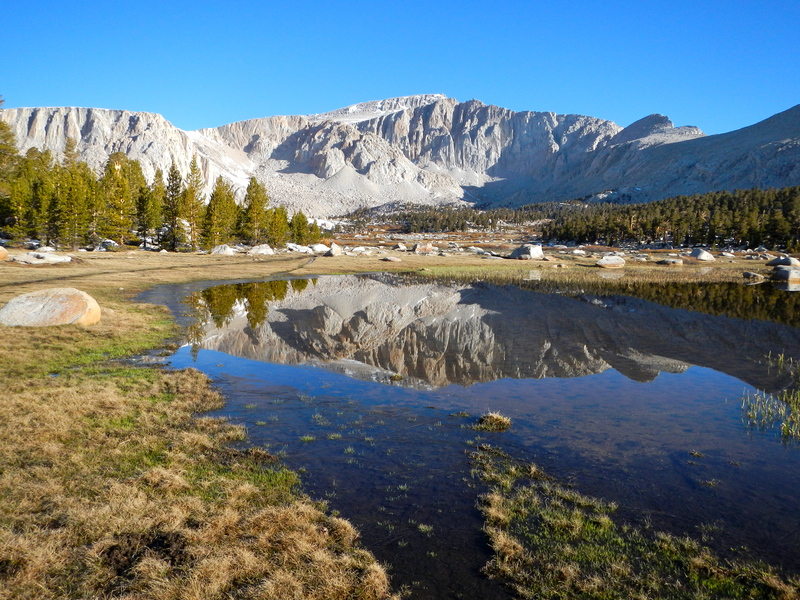 HOW TO GET LOST IN THE HIGH SIERRA’S and WHAT NOT TO DO…. When there is a snow front moving in on the mountain range, pay attention. Just like little bobble-headed dashboard divers, we went to the rangers station in Lone Pine, where they shared the front was moving in. We nodded in sync and got our permits for our over night camping by the Cottonwood lakes (which we never made it to) and then drove up the Whitney Portal road, turned left at Horse Shoe Meadows road (just past the Alabama Hills) and then up 7 or so more miles to the right turn off for the CottonWood Lakes Trail. In the image above, the Whitney Portal road leads up to the left turn for Horse Shoe Meadows road. As you can see, there is cloud cover coming in all over the range. Nothing too much to worry about yet, Right? Not SO! Here we were able to get to the car park with no real difficulty. A little snow, which made it a little challenging, but we were optimistic about our exit.Please note, this car is a front wheel drive Camry, no chains or four wheel drive like my car. Can you get a sense for where this is all going? We left the car at about 10am, after we got coffee and last minute supplies in Lone Pine. What is a trip to the mountains without coffee and a donut to boost the energy levels! Magic. So now we must get ready for the trail and ascent of the mountain, so we get all our gear together. I am completely layered up as you can see the snow falling around us. I am wearing a thermal layer underneath (cotton, spandex, pollyester blend) North Face technical shirt (quarter zip) and REI Trousers, North Face Summit Series fleece lined windbreaker jacket, Thermal Liner gloves, Mountain Hardware gaitors, Smartwool socks, Columbia Leather boots and my pack is the Osprey Aether 85. On board is an REI ice axe, Black diamond crampons, Atlas Cabela’s Pro snow shoes, REI Ascent SL hiking poles, Camelbak 3l bladder, map, compass etc. As we approached this snow hare we took care as this is a stuning creature and the pictures really don’t do it any justice. It is much larger than it seems in the picture and we got so close to it before it took off. 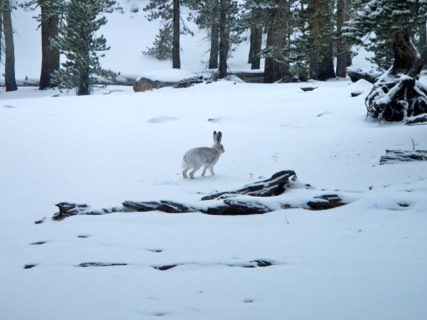 It truly is amazing how they survive and adapt to winter at altitude in the snow. What a beautiful creature. If you look closely, you will barely notice to my left, there is a ridgeline in the distance, but the cliouds and snow covered it up. We knew the peak was due North of us, so we began to create our own trail in the fresh snow heading North. Be sure to have a good topographic map and compass, and have experience orienteering before venturing out in bad conditions. If you ever get lost, this is your way to get back. Most folk that get lost, have no map, and or no idea how to use it. We decided to bivvy overnight as the conditions were to harsh and night was crawling in on us. A word of caution: As night moves in, and conditions are poor, lost or not it may be advisable to set up camp, bivvy and keep somewhat protected overnight. Chances are, if you keep going, in a semi-paniced state, you will only bury yourself deeper into the situation, with negative results. A good nights rest and a fresh start can make all the difference, especially at elevation where your struggling to acclimatize. Once we chose our site for camp, leveled it out so it was almost flat, we took our outer shells off in the tent and got comfortable. Being as lost as we were, in the High Sierras, it was important that we rest and recoup after the long days events, physical and mental. Mashed potatoes with bacon bits, noodles and tea were on our menu for the night. As you can see, I used an REI sleeping pad to keep myself off the cold ground, keeping warm helps with attitude. This is why we set up camp. Look how much snow fell.. The snow fell so hard that we had to get up in the middle of the night to clear it off the tent. We had about 1.5 feet of snow in 6 hours. It was worth getting up however to look at the moon through the trees – as nature called anyways. It looks like night, but this is day light on the Saturday/next day. The snow was falling again and the clouds engulfed the mountains. After collecting our gear, the snow began to subside. We hiked out just before sunset and reached our car (which was now completely buried in a block of ice) after dark. After digging it out, and scraping off all the ice with old CDs, we had to nurse the car down the snow packed mountain roads back to town. Needless to say, the heat was on full blast for nearly the entire trip home. Always be prepared for challenges. Be mentally strong and stay positive, sometimes it may not go your way, or be as easy as we anticipated it should be. When you lose track, or become misdirected retreat to your last known location to try again. Otherwise, you may not have the chance. Mountains are unforgiving, they are bigger than we are and they only allow us to climb them, if they feel like it – as we learned on Mount Langley. Langley will be attempted again in early 2012 so check back for the results of our return! ← Not everything we do is in the winter.